Davey O’Brien Awards are nice (and heavy), but Jackie Newton is more excited about her son returning to Auburn earn his degree. There was never really any doubt—if Jackie Newton’s son Cameron was going to go back to school, he was going to go back to Auburn. And he was going back to school—he promised. The first chance came in January, after finishing his sophomore season with the Carolina Panthers. Newton says she “was so happy to hear hear it,” but she wasn’t expecting it. “His father and I were talking and next thing you know, he (Cameron) came over and said he was enrolling in school”—that is, he was re-enrolling at Auburn, inevitable “circus” notwithstanding. But Newton says her son is having to work for his greatest moments in the classroom as hard as anyone else. If he does, if he earns his sociology degree—Newton says he has one more semester—will he walk to receive his diploma? If it is, and if he does, the applause will obviously be the loudest and longest ever heard at an Auburn commencement ceremony—you know it, I know it, Jackie knows it. That’s why she’s so happy he’s back—at Auburn. I love that guy and his momma! 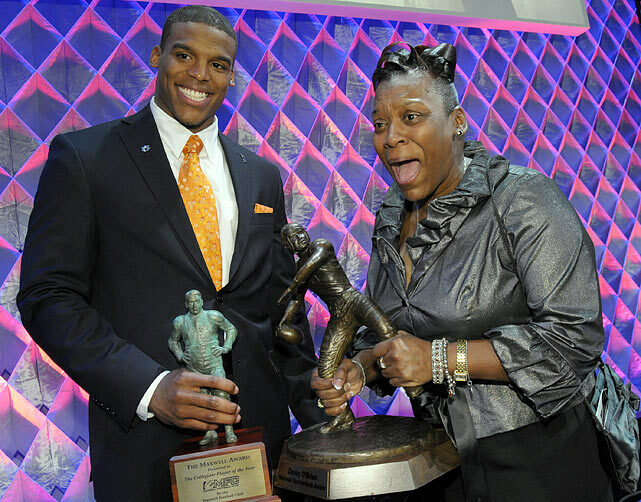 You are doing the right thing by going back to school be blessed Cam Newton and family.